“Sales of existing homes in the U.S. fell in January to the lowest level since records began nine years ago and prices slid for the sixth time in seven months, posing a threat to consumer spending, the largest part of the economy. Resales declined 0.4 percent, less than forecast, to an annual rate of 4.89 million from a revised 4.91 million in December that was higher than previously reported, the National Association of Realtors said today in Washington. When John McCain claimed he didn’t really know much about the economy but that he “did buy Alan Greenspan’s book” I nearly fell off my chair. If Greenspan had any dignity he would decline comment. But he doesn’t. Whatever happened to, “There are no second acts in American lives” ? The liquidity issues in the credit market (auction rate securities for municipalities and so on, for example and mortgage lending standards, increased 30-year fixed conforming loan rate) makes me believe higher interest rates may be here sooner than later ….and that’ll force pricing down further. The problem isn’t Greenspan, it’s the loan sharks who conned people into mortgages they couldn’t afford. I was watching TLC the other night, some show called “My First House.” I’ll be damned, we watched the BUYER’s agent con her. 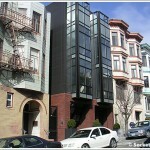 She said, I can only afford to pay $176k for the house (yes, this was NOT SF). The agent showed her a more expensive house, then sold her a 2-1 buyback by saying “it’s the same monthly payment.” Just like that Single Mom, US veteran with 3 kids becomes a subprime statistic. I benefitted greatly from lower interest rates–I refinanced student loans from the late 80s, saving a bundle. Yeah, and now he should have enough respect for the position he held to such great acclaim to refrain from public comment. You don’t see American presidents comment on policy, do you? (OK, other than Carter — but who listens to him?) No, you don’t. The guy is plainly out of line. He knows his comments can roil markets. He knows it. But he still does it. It’s mischevious, and it’s not ethical. I saw that same episode on TLC. That poor woman’s rate goes from 3.77% in year one to 6.77% in year 3. It definitely did not seem like she understood that her payments were going to be jumping up. Way to go Coldwell Banker Boise. Of course the SLIGHTLY lower prices we’ve seen aren’t attracting buyers. 2) home prices have been unaffordable to many people for a LONGGGG time. The only thing keeping them “affordable” were the availability of foolish suicide loans (option ARMs, IO ARMs, and so on). As these have evaporated, so have buyer’s ability to purchase. The prices may be cheaper now, but the buyers can’t get a loan! 4) a lot of home purchases are move ups or trades. Current homeowners can’t sell their house, thus they can’t move up/move on. nobody wants 2 mortgages in this environment. this is all why housing is “sticky” on the way down, and also why downturns take YEARS, usually 6-12 years to play out. it is also why the deranged hopeful fantasy that “housing will rebound” in 2008 or even 2009 is unlikely at best. FWIW: to show how crazy it was: I just watched Property Virgins, a Canadian show taped probably in winter 2006… they gave a young couple a mortgage for $250k. They were maybe 23years old?, had NEVER held jobs, were both unemployed and living with their parents. if they were buying in 2006, who is left? The San Francisco data we’ve already seen from DataQuick. But look at some of the other Bay Area counties/cities….not pretty. I saw a Property Virgins recently(not sure if it’s the same one you saw) and these two young couples, unemployed, been lolly gagging for 2 years traveling all over the world were approved for a $200k loan!!! This is the couple that wanted to live on a farm and raise birds or some crap.